It only took one week after the launch of iPhone for Saddlebeck Church in Dana Point, California to design their own Jesus phone screen saver for the iPhone. The caricature image of Jesus for iPhone is being used as a light-hearted fund raising initiative to sponsor technology addicted youth for summer church camp. 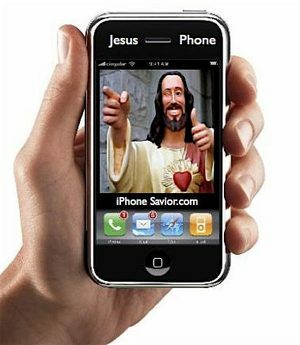 Youth Pastor James Stumplegger said; "the iPhone is super seriously hot right now, especially with the nickname Jesus phone. I saw my chance to cash in and jumped on it with my one good leg, because them tech kids need some Jesus, seriously." The Jesus phone screen saver sells for $6.95 and is available for download exclusively at the Saddlebeck Church website. A new screen saver design featuring the young Steve Jobs inside a money machine is also being considered. Dude! You are sick... and funny... and sick! Great to hook up, Bro!